Total scams! Did I need to say? What's up, Bristol? You seem to like LA right now! This time around it's Portishead's time to come to town for their Coachella festival rehearsal. The excitement surrounding their only US show for 10 years helped sell-out tix...but if you were too lazy or disorganized to sort some out (don't look at me ;) ) you had a chance to cop some super-rare tix for this rehearsal show for fans and industry-types. Portishead's presence on US soil also coincides with the release of the band's third album, simply entitled, "Third". And it's been three years since the last one! I wrote about it on the SEEN blog. You can pre-order on the band's website. Here's my video edit from the amazing Aztec-inspired Mayan Theater - it's almost like you were there, right?! She's holding a $250,000 precious metal and diamond-encrusted dagger that represents Belvedere Vodka's latest brand, the aptly named 'Dagger'. My sensitive nose smells hype-shite so why am I talking about it? Show us yer Bristols Oh yea, my mate Inkie is doing murals at all the launch parties (Mumbai, New York, LA, Cannes and Ibiza) which feature Jade Jagger caricatures. Now that's kinda cool! I got to meet Jade at a Hollywood hotel this weekend, but I was more excited that Ben Westbeech was in the hiz-ouse and that Inkie is gonna do me a canvas! Yea, they're not household names, but Ben's a Bristolian singer who I discovered on Annie Mac's minimix (BBC Radio 1.) His Switch collaboration is tres chic! And Inkie is old skool graffiti family! Or as as 'Fashion Week Daily' said, "Inky (sic), a famed London graffiti artist..."
Hype Machine If you want to hear some of the official yaddayada here's more of the FWD interview with Jade: "I drew my inspiration from medieval daggers and worked with the finest stones to create the pieces, which are fun and work to bring a pure experience to enjoying vodka." "The "Jagger Dagger" will be part of an extravagant experience when a magnum of Belvedere is ordered at select nightclubs, including 1OAK in New York, Crystal in London, and VIP in Paris...A limited number of these ice daggers will be created, each with a retail value exceeding $250,000 and available at a select number of retailers, including Harrods....For those less inclined, a range of daggers--each studded with 12 carats of white topaz, 42 pieces of stunning Aquamarine, and priced at $10,000 each--will be available at exclusive retailers." "...After excitedly posing with the artist, Jagger instantly decided the fate of the artwork. "I kind of think I'll be keeping it!" she mused. "It's pretty splendid!" Cupcakes and trees On the weekend there's usually a line at a store in Beverly Hills. Nope, it's not LV, Gucci or Manolo Blahnik. It's a cupcake store called Sprinkles. I hate hype so I've ignored the reviews and increasing lines, but this week I might have to buckle as TreePeople and Sprinkles have collaborated. 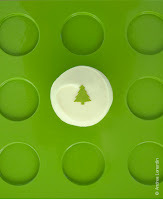 Each tree cupcake sold gives cash to the environmental cause. So now you can be Saintly as you stuff your face! LA was overrun with Bristolians this weekend! I met up with Inkie and his mate Ben (Westbeech, singer/songwriter) at the standard to begin an east LA tour (Seventh Letter graffiti spots and Thai massages) before we went up the hill to pop in on Ja in Silverlake (aka Montpelier) for a cup of cha. After a couple of poolside drinks and lunch we all got a ride with Clari, another Bristolian who's here doing fashion tings till the summer. We all hit up Venice and Santa Monica (aka Knightsbridge-by-the-Sea) and soaked up the wind, the sun and the sand before retiring at the Huntley for drinks and the awesome view. 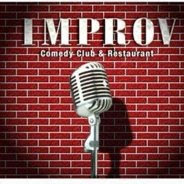 I went to the Improv Traffic School today for my 8-hour remedial class following my red-light camera fine of $380! Ouch! Only in Hollywood? This traffic school is hosted by stand-up comedians?! And you want some laughs if you're stuck in a class for 8-hours! Last time I was here there was a Baywatch Hawaii model/actress and a strip-club DJ?! This time around the (slightly extroverted) tutor went around the room asking fellow students what they did for a living and how they ended up in traffic school. As she reached a 40-something blonde lady in the corner, she said, "we love your work..." I suddenly paid attention. Oh, it's that woman from Hand That Rocks The Cradle! Yep, an attractive, but casually-dressed Rebecca de Mornay was in my traffic school. Hahhaa. That was the only star sighting, unless you count the guy who's been presenting QVC for 10 years and a slightly arrogant stand-up comedian dude! Of the normal (aka 'regular') people, Hillary, the luxury product concierge and event planner was fun. 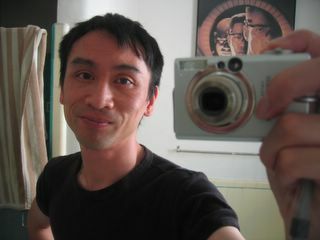 And very Euro...white shirt, jeans, steel Rolex, classic LV monogram bag. Come on, she's in luxury retail dahhhhling ;). Quote of the day When discussing driving awareness and attitude, the tutor asked: "What makes the difference between having an accident and not...?" Vegas, Vegas, Vegas! It's no fun when you're stuck in a convention exhibition hall for the week!! I won't lie, I did get to sit by the lagoon-like pool for a moment and sip margaritas and eat at the extravagant hotel all-u-can-eat buffets, but those were exceptions to the working rule. At night, I managed to muster up the energy to explore off the strip and found some nice hole in the wall joints thanks to Yelp. Check them out on the Yelp widget on this blog. Cheers! I'm off to Vegas for a trade show this week. And I've been thinking about all the flying I've done. I'm one of the millions of business commuters that travel around this vast country in the name of work. None of us think twice about it because we don't pay the bill! We *might* think twice about which airline we fly , but only for the frequent flyer miles we're collecting! Delta sent me a message about its "Conservation Fund" which plants trees on behalf of Delta's passengers at Marais des Cygnes National Wildlife Refuge in Kansas. This got me thinking. 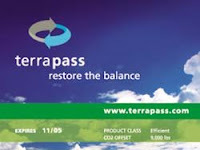 Terrapass In the past, I bought a airline ticket for a personal trip on Expedia and was offered numerous options. The one that caught my eye was Terrapass, a service that lets travelers pay a surcharge according to how far they travel so trees can be planted to try to offset the carbon-emissions created by flying. I bought a pass for the 3-4000 miles I was traveling, but haven't bought another since. Not because I don't want to, but mainly because it's not offered through all retailers I buy tickets from, and also because any corporate travel agent isn't part of this type of scheme. Federal, international and global taxation There's no way we will ever eliminate business travel, or expect people to pay extra voluntarily, so I think that companies should have to be penalized financially as a travel *dis*incentive! What's wrong with web-meetings? If governments created a mandatory environmental travel tax we would be well on the way to changing ill habits. I see it like the central London Congestion Tax on all motor vehicles. In this case, instead of putting the money into infrastructure, the "taxed" money would go into protecting the environment. No April Fool...the classic "Yo! 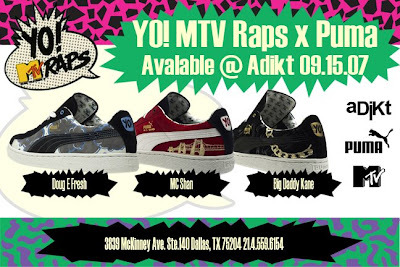 MTV Raps" is back for its 20th anniversary! But only for the month of April, so catch it whilst you can on TV and online. To commemorate seven years of amazing rap TV (1988-1995) MTV is sharing all this hip-hop goodness with us. Remember Ed Lover, Doctor Dre and Fab 5 Freddy? And to support, SEEN, the music blog I contribute to wrote a lil' something to show MTV love! Top 20 Imagine trying to boil down 80s-90s rap to 20 top videos? Well, Fab 5 Freddy gave it a go. The three elements that matter? Videos that had heavy play rotation, had a memorable vibe, and helped transform the hip-hop world (aka huuuuge impact). London in the house! Where were you in 1982? I'm not talking about Vashtie's hip club in New York, I'm asking if you were in London in 1982 when Grandmaster DSt performed? I know Janette Beckman was there because I saw her pictures from that era at her book launch at Taschen, CA 90210 (aka Beverly Hills). Now I have to admit, I didn't know Janette was English. "Where are you from, I can't place the accent...," she said. "It's easy..." I replied. "Bristol, London, Los Angeles!" Uptown, Downtown Beckman's photos really capture the '80s hip hop scene in its infancy and are firmly rooted in East Coast America. I read that she moved to New York in 1982. By that time, the downtown scene was in full effect and folks like Fab 5 Freddy were bridging the uptown/downtown gap. F5F was key to getting the first hip hopper downtown: Afrika Bambaataa (who's photographed in Beckman's book) played Mudd Club, Negril, Danceteria. Then Grandmaster Flash went to play to the honkys too ;) Not sure if Janette hit the South Bronx parties like Malcolm McLaren did to capture her art though. Punk Rock, New Wave and Soul I also read that Beckman started working for coolzines The Face and Melody Maker snapping punk and rock bands which led to her first book in 2005 for Powerhouse Books, "Made in the UK: The Music of Attitude 1977–1983." Doraemon Beckman said,"nice t-shirt," looking at my WrongWroks "Doraemon" shirt. "Let's swap t-shirts," I said to Janette as I spotted her dope Acapulco Gold collaboration t-shirt. Here's an interview about the Acapulco Gold collaboration. Fatseagulls? Imagine "a blog about the world of t-shirts" ~ yes it exists and I found it as I was looking for the fresh Acapulco Gold t-shirt. I'm late writing this story 'cause it got buried with other stuff, but it's still close to my heart so I'm sharing. I found this obscure bit of hip-hop heritage on New York's "Daily News" website: "A Bronx apartment building where hip-hop was born in the 1970s won a temporary reprieve Monday from being sold and its longtime tenants forced into the streets." If you've watched any hip-hop documentaries or or read any books that go back to the roots of hip-hop you may have heard about DJ Kool Herc. Yes, it's a cheesy name, but think about the time he was "the man"...1970s, Bronx, New York. NYC wasn't the pretty city it is today, but that didn't stop Kool Herc (aka Clive Campbell) from inspiring a generation (and Grandmaster Flash) of disenfranchised youth to build the global phenomenon that's hip-hop culture today. These are the breaks! Kool Herc didn't invent scratching, nor did he have the best record collection. 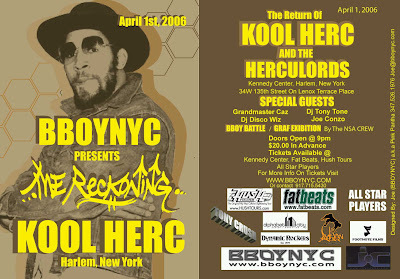 But, Kool Herc was one of the first to DJ music that MCs rapped over. He knew the percussive "breaks" in the records, which dancers loved. Herc's Jamaican upbringing gave him the know-how to rock a party with the best sound-system. That brought the party people, the girls, the cool dudes who loved the breaks, hence the phrase "break-boys" or "b-boys". That's hip-hop! Today, the basement community room of the Morris Heights building where Herc threw his first parties in will be turned into a low-income cooperative with the help of the city. "This is about affordable housing and the American dream," said Herc with Sen. Chuck Schumer (D-N.Y.). Fred Segal is a fashion institution in Los Angeles. What better place to launch the Warhol x Levi's x Damien Hirst line of clothing? I went to the launch party for this supposed temporary store. Well, as I remember I already bought Tina the tote and keyring from the range at the Paper temporary store event on La Brea last year?! At the Paper event I got myself a custom Warhol x Levi's x Damien Hirst t-shirt printed...for $5! (I wanna add 'American Apparel' too as they supplied the t-shirts but that would be a looong name for a collection!) Compare that to the $255 blouses and jeans on offer at Fred Segals! You get what you pay for? The apparel and denim on show were definitely more defined and curated into a collection. I woke up today this morning in Redmond, Seattle. Yes, I'm here for a meeting with my company's Microsoft account managers. I mention this because National Public Radio (NPR) ran a story that made me very grateful. Today, companies like Microsoft file work visa applications for highly-specialized people from outside of the US. People like me! The application is highly over-subscribed. 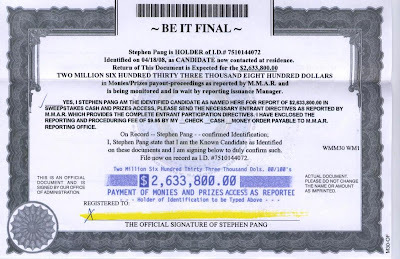 There are only 65,000 a year (unless you have a Masters degree which opens up a special quota of an additional 20,000 visas) and in previous years the government ceased accepting applications in one day and resorted to a lottery to chose who received a visa...Scary! Good luck to everyone who is seeking a job in the US. It's not getting easier...and did anyone mention the word...'recession' aka 'contraction of the economy'? !